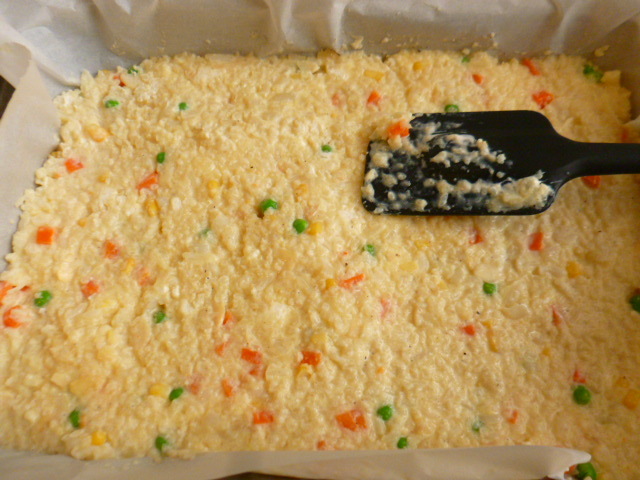 With a request to develop a “vegetarian, starchless bake”, the decision to use cauliflower as the main ingredient was quite obvious, as this vegetable’s texture when cooked is as close to that of potatoes.In order to add color and different textures to the bake, while keeping preparation as uncomplicated as possible, I’ve added to it a mix of frozen vegetables, along with sliced almonds and two types of goat cheese. 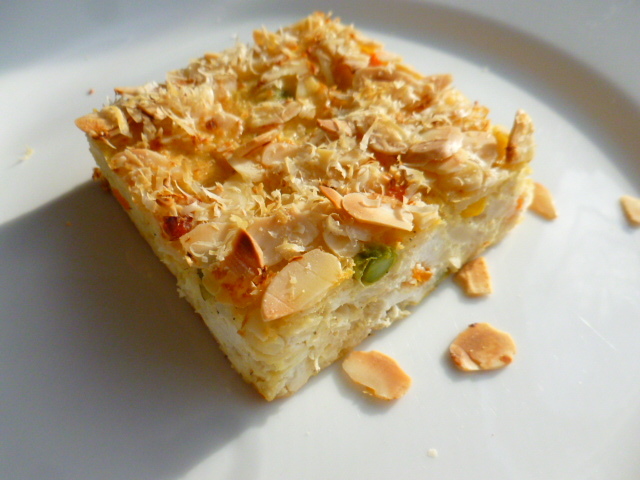 I then simply seasoned the mixture with freshly grated nutmeg and four peppers mix, and topped it with additional almonds and cheese, to create a tasty, crunchy topping. 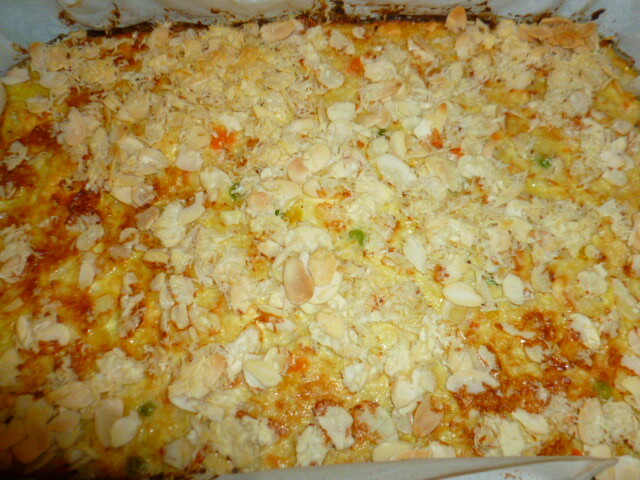 The result was a flavorful and aromatic bake that can be served on its own, as a light main course, or as a side dish. Try it and enjoy. 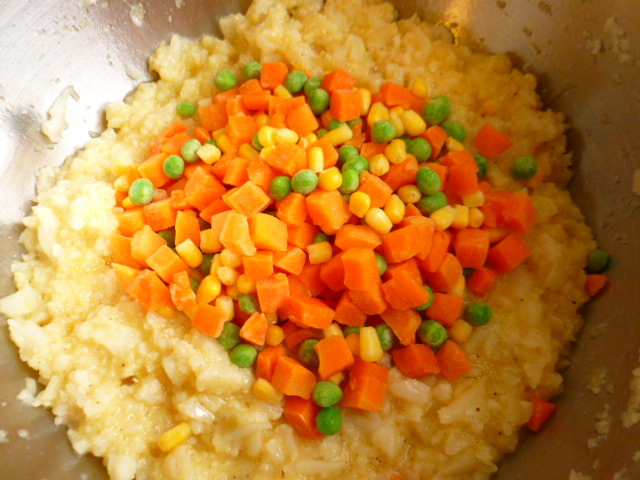 * Using frozen mixed vegetables makes for easier preparation. If you prefer to use fresh vegetables, steam them lightly before adding to the mixture. * Due to the fact the bake contains no starches, a fairly long baking time is needed in order to stabilize it. * If you can’t find wine soaked goat cheese, Pecorino or Parmesan cheeses can be used instead. * The bake can be kept in the fridge, covered, for up to two days. To keep the crunchiness of the topping, make sure to reheat it in a toaster oven, not in the microwave. 1. 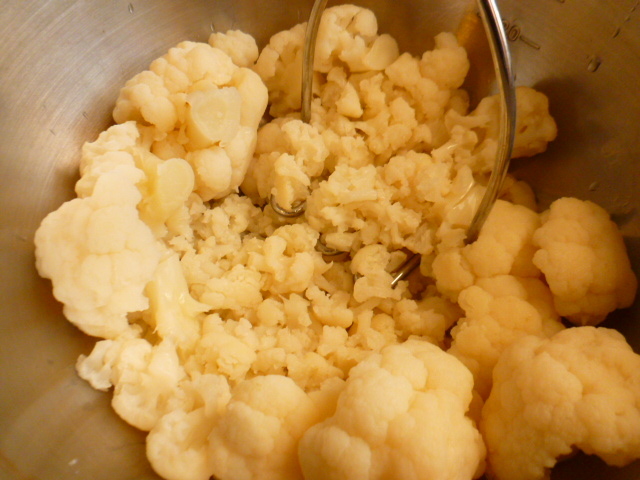 Trim the cauliflower, wash and place in a large flat pot, in one layer. Add the water, cover and steam over high heat, for about 10 minutes, or until the cauliflower is tender. Strain, if needed, and mash coarsely with a potato masher. Measure 4 cups and place in a large bowl. 2. Preheat the oven to 370F (188C). Line a 12” x 8” (20.5cm x 30cm) pan with baking paper. 3. 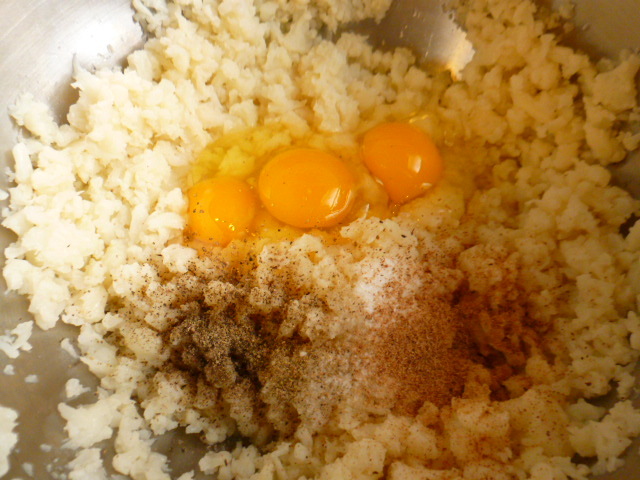 Add the eggs, salt, nutmeg and peppers mix to the mashed cauliflower, and mix well. 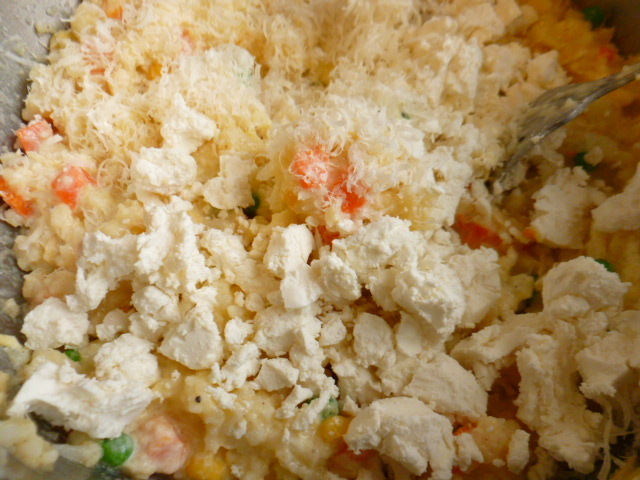 Add the frozen vegetables, sour cream, almond flakes, grated goat cheese and crumbled fresh goat cheese. Mix gently, so that the fresh goat cheese chunks will still be visible. Pour the mixture into the lined pan and level the top with a spatula. 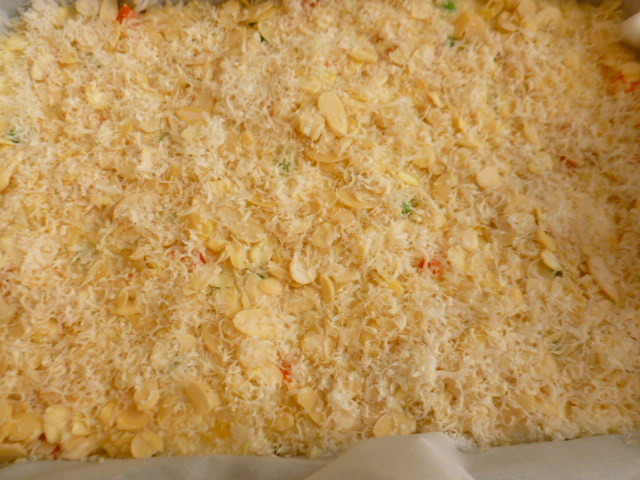 Sprinkle the grated goat cheese and almonds for the topping all over. 4. Bake for 1 hour 10 minutes, or until the bake is set and the topping is golden. Is there any reason not to just use potatoes if there are no diet restrictions? Ah, good point! I’ve never cooked with cauliflower as a substitute for potatoes, so thanks for the warning about the “tiger pit”. Great recipe ! Looks so beautiful & delicious !! Yes, I totally agree with this ! Looks amazing, I love goat cheese and really like the way you have used it here. And the almonds flakes must add such a great crunch. Love the recipe and thank you for sharing! This sounds so delicious. Great for meatless monday 😉 and I also love Goat cheese. Really love this recipe. 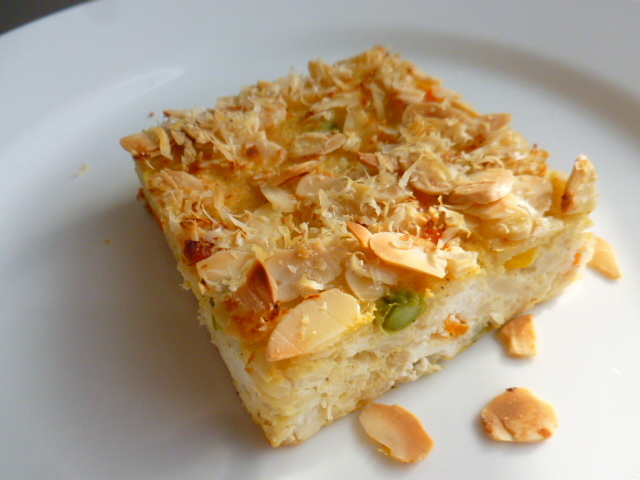 And am wondering whether a swap to something like pumpkin for the cauliflower would work, to make this bake more FODMAP. Had to let you know, recipe worked beautifully with butternut squash, baked unpeeled and whole in the prep stage. Will definitely be making again. Fascinating. I wonder if Drunken Goat cheese would work? This recipe looks good. I’m trying to eat more recipes like this…if only I can stay away from sweets. Superb and so clever! Loving this! 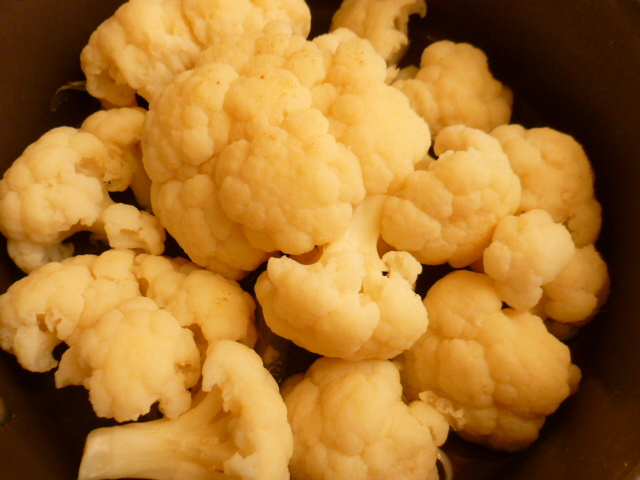 Cauliflower is one of my favorite veggies and love the way you’ve used it in your recipe. Wine-soaked goat cheese? I will have to look for that! Thank you Judi, I’m glad you liked the recipe. I love cauliflower but have to admit I don’t use it often enough. This bake will definitely change that! Wine is my favorite beverage too! 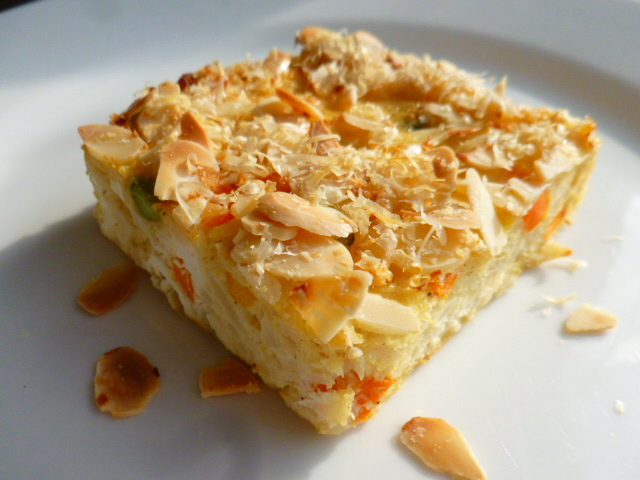 oh a savory cake… so wonderful! Great share and loved the addition of cauliflower in the bake. I bet they taste absolutely delicious. This looks more like a tasty dessert than a side Ronit. Lovely presentation. Wow, I never would have guessed to cauliflower could be successfully used to make a bake like this. I never realized that cauliflower was a starchy vegetable. Now that I’ve seen how you’ve used it, it makes me want to experiment with using cauliflower in new ways. Wow, is this ever fun! 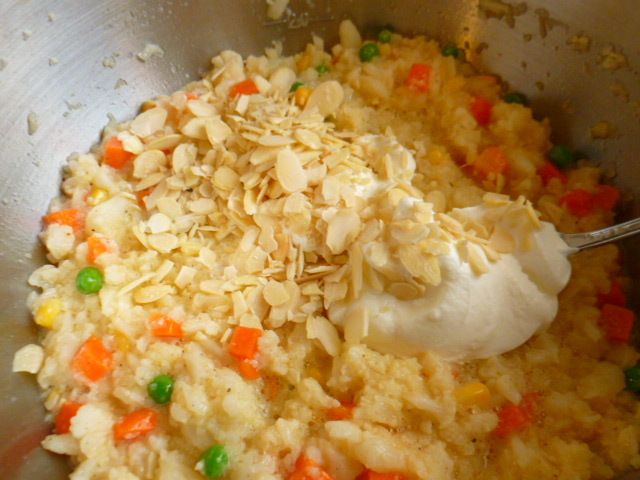 What a great solution for someone looking for a panful of yum as a holiday side dish or on an Easter brunch table. Wine soaked goat cheese, huh!? I imagine that could be made at home, too, if I can’t find it at the store or it’s way too pricey! I have never heard of it but it sounds so appealing!! Thank you Mollie, I’m glad you liked the dish. It’s indeed very suitable for brunch buffet. Lovely recipe. .. very innovative. Love this recipe Ronit! Great flavor and texture combination as well!